The Mushroom House is a stone-built cottage in a small row nestling on the eastern side of Rosedale about 1.5 miles outside Rosedale Abbey village. It is in a tranquil setting on a road which ends further up the dale and so has little traffic. The view from the front of the house looks out right across the valley of Rosedale with its farmhouses and extensive fields. The row of old iron-miners' cottages is made up of a mixture of permanent residences and second homes and so the area is consequently very quiet and peaceful. 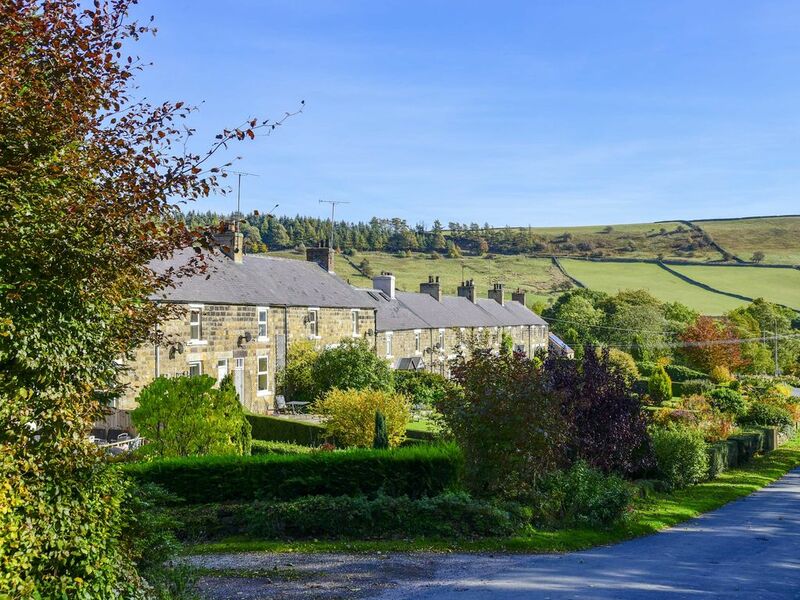 You can step outside the door, pull on your walking boots or get on your bike, and set straight off into Rosedale and the surrounding moors and dales for a gentle stroll or a serious jaunt – whatever suits you – there are no pressures out here away from it all. If you want to explore a little further then in a one-hour radius you have everything from the wonderful seaside town of Whitby, the quaint Runswick Bay, the magnificent Castle Howard, ancient York, pretty Helmsley and even a theme park at Flamingoland not to mention Scampston Gardens and Dalby Forest. This is just a small selection and there’s more information in the Location section of this site and in the box full of leaflets and guides in the cottage itself. Rosedale Abbey village has two tea-shops and three hostelries (all serving food) and there are other excellent places a few miles further away such as the New Inn at Cropton (with its own brewery) and the Blacksmiths at Lastingham. Then of course there’s always Whitby fish and chips! The house itself has 3 bedrooms upstairs (1 with super-king-sized bed, 1 with double bed and 1 with single top bunk and a child's pull-out bed) and a lounge, kitchen and bathroom downstairs. We have decorated and furnished the house to a high standard so that our guests will feel well looked-after, relaxed and at home. The comfortable lounge has two sofas and an open fire. All three bedrooms are decorated in individual styles with lovely views from all windows. There’s a garden to play in at the front and a secluded lawn at the back ideal for barbeques on the fire pit. The house has a modern and well-equipped kitchen as well as a modern bathroom with bath, shower, basin & WC (towels not provided). At the front of the house is a stone patio which looks out over beautiful Rosedale. At the rear is a secluded lawn backing onto the fields and ideal for sitting quietly or barbecuing. If you want a real idea of the place then read the reviews our past guests have kindly written. We couldn’t have put it better ourselves. We are Michael & Jackie Reeder (accountant & teacher respectively) and live in Sheffield. We have a 30-year old son (budding entrepreneur) and a 26-year old daughter (junior doctor). We both grew up in Stockport but have lived in Sheffield for over 30 years now. We bought the house in 2003 and for the 10 years up until 2013 we worked to bring the house up to its current standard whilst at the same time enjoying many happy times there and on the North Yorkshire coast with friends and family. The house is furnished and decorated as a second home for us and we hope it feels like home and not just somewhere to sleep whilst on holiday in North Yorkshire. This house has been both our escape from our busy city lives and the base for some wonderful times with friends and family. Its location in the lovely surroundings of Rosedale with just a 20 minute walk down into Rosedale Abbey village was ideal and it felt far enough away from the rat race to relax the instant we got there. The peace and quiet (you can truly often only hear a cockerel crowing or an owl hooting when you sit out on the front patio or in the back garden). The view out across Rosedale is lovely at any time of year. Rosedale Abbey village with its couple of small tea-shops and two nice drinking/eateries is just the right size with friendly local people but never too busy. The village is in an ideal location for countryside pursuits, visits to the seaside and days out at the many attractions in the surrounding area. toilet, combination tub/shower, The bathroom is downstairs. Towels are not provided. Landline available for guest use in emergencies. There is no mobile signal at School Row. Individual electric thermostatically-controlled, wall-mounted slim panel heater in each room. The heaters are very modern and efficient. They will keep you toasty warm even when it is snowing outside. All bedlinen provided (including for extra pull-out child bed but not for travel cot). Towels not provided. Washing machine fitted into kitchen. An open fire for cosy winter evenings. We provide coal and logs for your use. Lockable garage with insufficient space for a car but plenty of room to store bikes and other outdoor/sports equipment. Broadband is available over the Wi-Fi network in the house. Two sofas: 1 double and 1 for 3 (or even four slim!) people. Coffee table. Smart TV , CD player and iPod dock. Standard fridge with no freezer compartment. Separate worktop electric ice-cube maker will keep you supplied with cool drinks. Ceramic hob. Easy to use and easy to clean. We provide a welcome tray and small quantities of basic goods that you may have forgotten to bring e.g.dishwasher tablets. 2 x tea towels. We have provided everything you need and some spares! Well-equipped modern fitted kitchen with quality utensils. There is a folding dining table in the lounge which will seat 8 people when fully open. Freeview channels only. No subscription channels. CD player & radio. iPod dock. Two shelves of books (maybe 40 or so) plus some reference books. Cupboard containing quite a few board and card games. In the garage there is a cupboard with beach toys such as a cricket set and buckets and spades. Front lawned garden suitable for gentle badminton etc. Small secluded raised lawn at the back, ideal for barbecues or sitting quietly and taking in the view up the east side of Rosedale. Stone patio on the front of the house with two patio chairs and a table. Additional folding garden chairs in garage. A 9-hole pitch & putt (max hole length 130m) set on a hillside just outside the village. Great fun. Nearest club in Kirkbymoorside, about 6 miles away. Special touches such as hand-made cushions and Joseph Joseph utensils make this house a home-from-home. We have tried to think of everything that you might need to have a really wonderful holiday and make you feel like you’re in a home from home. The main super king size bed is super-comfortable and the double bed in the second room and the Stomp bunk in the third bedroom are also excellent. We’ve rented holiday cottages ourselves and we wanted to make sure this was as welcoming and comfortable as the best. We have just had the most wonderful long weekend at this cottage. Everything we needed for a 3 night stay. Much appreciated welcome tray awaited us after a long drive. Kitchen had everything we needed. Beds were very comfortable. Coal and logs left for us to make a fire in the evenings, which we really enjoyed. The cottage has beautiful views and is perfect for exploring the area.We would definitely recommend this cottage. Thanks very much for this glowing review. We too love the fire in the evenings followed by a good nap aided by all the fresh air from exploring Rosedale and beyond. Rosedale Abbey is a small village in the North Yorkshire Moors surrounded by beautiful countryside ideal for those who love walking or cycling. The house is 1.5 miles outside the village in a tranquil setting with great views. The village, which has two cafes and three welcoming pub/restaurants all serving food, is popular for visitors but never too busy. There is also a fun 9-hole pitch & putt golf course on a hillside as well as Gillies Jones designer glassworks. Whether you want a relaxing time away from it all, a trip to to the coast, a walk or cycle in the North York Moors or trips to stately homes and gardens all topped off with afternoon tea or a refreshing drink and a tasty meal then all are within easy reach of The Mushroom House. It is a 30 minute scenic drive over the moors to the famous seaside town of Whitby where you will find numerous cafes, restaurants, interesting shops, and all the usual seaside attractions. Enjoy a walk around the bustling harbour, an ice-cream on the beach and an excellent fish and chip supper in a restaurant overlooking the sea. Sandsend Beach and Runswick Bay are only 35 minutes drive from the Mushroom House and are wonderful for walking and swimming. Fresh Whitby crab and fish are often on the menu in local cafes and restaurants. Scarborough is about an hour away. Robin Hood's bay and Staithes are charming little seaside places that are well worth a visit. The market town of Helmsley is only 13 miles away and has many attractions including Duncombe Park, Rievaulx Abbey, The Walled Garden with its excellent cafe and lovely little shops selling local goods. The ancient city of York is within reach and makes a great day out (about a 1 hour drive away). The famous stately home of Castle Howard is about 40 minutes away. The steam trains of the North York Moors Railway run from nearby Pickering through the countryside to Whitby via several village stops including Goathland where the TV series Heartbeat was filmed and whose station might be better known as Hogwarts Station. Flamingoland is an adventure theme park about 14 miles away on the road to Malton and a little further along the same road is Eden Camp, a fascinating museum about life in WW2. Rydale folk museum and Dalby forest are also excellent days out for families. In the spring you should visit Farndale and walk along the river to admire its beautiful display of thousands of wild daffodils.